In such venal times, what other refuge is there for anyone but in the depths of the absurd? Anyone who reads the news these days can feel entitled to feel like never opening the curtains again, but there are those who, in the face of an avalanche of misanthropy simply put on the greasepaint and smile. Well, of a fashion. 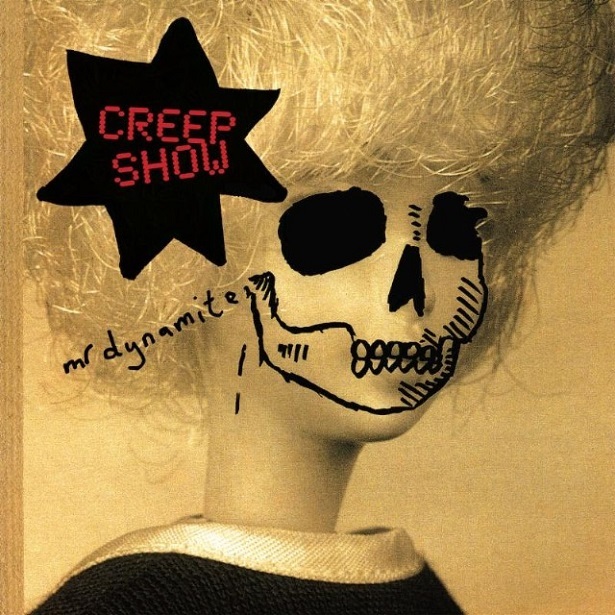 Creep Show is a collaboration between John Grant – a Coloradoan now native of Reykjavik – and Wagner, a trio of noiseniks who include one Stephen Mallinder, formerly half of Sheffield avant-Burroughsian industrialists Cabaret Voltaire. Retreating to rural Cornwall with a van full of creaking 20th century synthesisers, the foursome in turn have concocted a wickedly dystopian set of songs featuring as their avatar Mr.Dynamite, a virtual troll who in the form of Mallinder and Grant’s distorted vocals takes on a mischievous life of his own. Sending themselves up mercilessly, Mr. Dynamite reveals the duo as Dadaist funsters with a strong line in oddly affecting electronic noir; it’s stating the obvious to say this isn’t for everyone, but those that allow it some time to breathe will find it’s charms as sublime as they’re strangely comforting. You can read the review in full here. (A new window will open).